Police officers towing away a stolen motorcycle from the encampment where Luis Gongora was shot and killed last Thursday. Photo by Joe Rivano Barros. Two homeless witnesses to the fatal police shooting of Luis Gongora on Shotwell Street last Thursday say the police have harassed them multiple times since the shooting, most recently threatening them with arrest late Saturday night if they did not move their tents from the block. The pair temporarily moved across the street before returning to the block, where they were still staying on Monday. Both accepted placement to the Navigation Center over the weekend along with others from the encampment but said they were unsure of going. Additionally on Monday, an employee of the Department of Public Health — who wished to remain anonymous — said that the city prioritized residents of the Shotwell Street encampment for intake to the Navigation Center ahead of others who were in “higher need” of shelter. 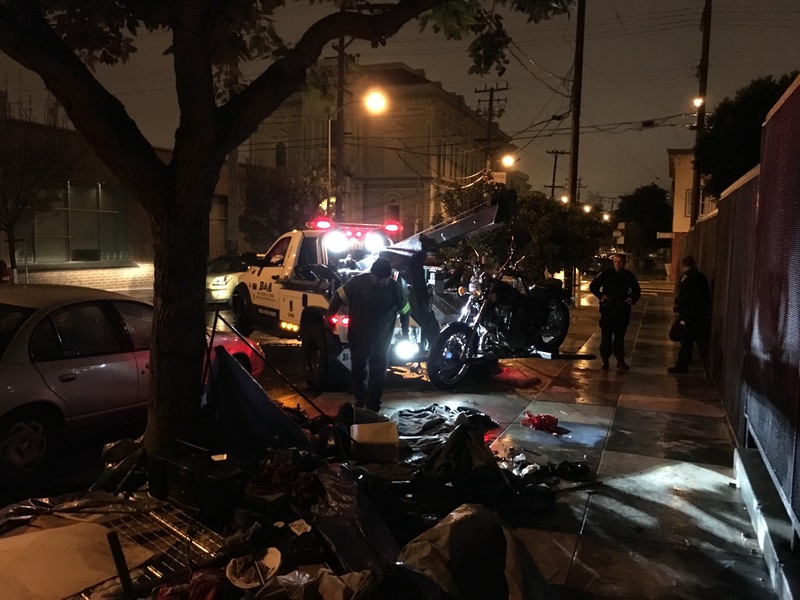 In a scene of the late-night raid caught on video by a witness, residents of the encampment where Gongora lived had their tents dismantled by police near midnight on Saturday. Police at the scene said they were searching for a stolen motorcycle and did tow one away a from one of the dismantled tents. Late-Night Police Search on Shotwell Street, Part Two from Mission Local on Vimeo. Video courtesy of Adriana Camarena. Stephanie Grant — one of the eyewitnesses to the shooting who has contradicted the police account — said Saturday night that officers have harassed her and her boyfriend multiple times since the shooting. “They’ve been harassing him ever since he’s gone on the TV,” Grant said of her boyfriend John Visor, another eyewitness who has been widely interviewed for his account of the shooting. Visor said Gongora posed no threat to officers and was trying to run away when he was shot at seven times. Gongora was a homeless resident of Shotwell Street between 18th and 19th streets who police say lunged at them with a 13-inch knife, prompting two officers to open fire. Officers first yelled at Gongora to drop the knife and then fired four beanbag rounds at him, and video of the incident shows that officers shot at Gongora within 30 seconds of exiting their vehicles. Six witnesses have contradicted the police account and say Gongora did not lunge at officers with a knife. Three homeless residents of his encampment said the monolingual Spanish speaker did not understand the police commands and attempted to run away after being hit with the bean bag rounds. Three other witnesses also said they did not see Gongora lunge at officers. One — a passer-by who spoke with Mission Local last week — said that Gongora had what looked like trash in his hand and that she never saw Gongora stand up. Two neighbors who saw the shooting from their windows across the street said that Gongora stood up when shot by beanbag rounds but did not threaten officers. The police department held a press conference on Friday and said at least three of 10 witnesses interviewed say Gongora threatened officers with a knife. Police did not say what the other witness accounts stated, but are sure to speak more at an upcoming town hall — a meeting the department holds within seven days of any police shooting. Police have not yet decided on the date of that meeting. Homeless residents of the block have been fearful of police retaliation. Department of Public Works trucks picked up trash from the block on Friday near midnight just after city staff had moved nine people from the encampment to the Navigation Center — a homeless shelter that can accommodate entire encampments at once. But residents of the encampment were suspicious of the timing, saying the city was scattering witnesses to the shooting. On Saturday, Grant and Visor said police threatened them with arrest after banging on their tent with batons, prompting them to move their tent a block down from their spot near where Gongora was killed. “They told us that if we didn’t move we were going to go to jail,” Grant said. Late-Night Police Search on Shotwell Street, Part One from Mission Local on Vimeo. Video courtesy of Adriana Camarena. Markael Raybond — another homeless resident of the encampment — said the police also told him to move from the area and threatened arrest if his tent was not gone from the block by daybreak. Raybond also said the police kicked and shattered candles near his tent meant to memorialize Gongora, a good friend of Raybond. “They kicked the tent and broke the candles, saying ‘Get out, get out, SFPD. If you don’t get out we’ll take you to jail,’” he said. Others had no warning. Adriana Camarena — a local activist who filmed the encounter — said some residents left the encampment when police arrived and that the police proceeded to dismantle the empty tents. Late-Night Police Search on Shotwell Street, Part Three from Mission Local on Vimeo. Video courtesy of Adriana Camarena. The police department did not immediately return requests for comment on the search. On Monday, a Department of Public Health employee who wished to remain anonymous said the city artificially prioritized residents from the Shotwell Street encampment for city shelter. The change granted the Shotwell Street homeless residents access to the Navigation Center meant for another Mission District encampment that was next for intake. The employee said the homeless outreach team — which helps move people into the Navigation Center — was hoping to move an encampment on Cesar Chavez Street to the center but that those spots were instead taken by those living on Shotwell Street. That contradicts statements made on Friday when Rachel Gordon, a spokesperson for the Department of Public Works, said the outreach team had been working specifically with the Shotwell Street encampment to get them to the Navigation Center since before the shooting. According to the anonymous Department of Public Health employee, the outreach team had indeed been at the Shotwell Street encampment the day of the shooting, but not to move residents to the Navigation Center. They were called there because Grant — the eyewitness to the shooting — is seven months pregnant. It was then that members of the outreach team noticed Gongora had a knife and called the police. “The first HOT team person on the scene noticed he had a knife, didn’t feel comfortable about the situation, called other members of the HOT team, and they decided to call the police,” said the employee. Members of the outreach team have become hesitant to call the police in the aftermath of the shooting, the employee added. Rachel Kagan, a spokesperson for the Department of Public Health, said she was not aware of the Cesar Chavez encampment being scheduled before the Shotwell Street one but said homeless residents of Shotwell Street were in need of shelter. “Everyone in that area had just had a horrible experience, so we needed to move quickly to improve the situation for everyone involved,” she said. The late-night visits Friday and Saturday nights followed comments made by Mayor Ed Lee to the Chronicle on Friday that he would crack down on homeless encampments city-wide for public safety, starting with the Shotwell Street camp. “I will be ordering the Shotwell camp to be taken down and for it not to come back,” he told the Chronicle. Not all were so supportive. Supervisor David Campos said the mayor’s comments were a “knee-jerk” reaction that amounted amounted to “playing whack-a-mole” with encampments. He said Lee should instead focus on reform of the police department’s use-of-force policy. Back on Shotwell Street, residents are exhausted. Grant said the late-night visits from city staff and multiple interview requests from reporters since the shooting have worn her out. The way this is being handled, I’m inclined to believe the the statement by the Department of Health Worker that as a political coverup this camp was jumped the line. But ifso, I think there has to be documents, and its the job of journalist to make public record requests, asking for immediate same day release of the records. After the two witnesses went public, I worried this would happen. It’s a cliché, but cops is cops. Great reportage, Mr. Barros. I just don’t know what to say. The political coverup and mistrust is great. Removing the encampments is not a solution to both growing problems. At risk, the elderly and children are being pushed further into the ugly underbelly of homeless that are druggies and deviants. I pray the the city and even myself, come up with with a humane solution. And the ‘he had a knife and lunged’ dialogue has got to stop as well. Please pray.